Yeah, I think USC still has a 80% chance of winning the south just because of how unbalanced the schedules are. But USC can't claim to be the best team in the south! How would you like your crow prepared? What’s nice is that the Utes control their own destiny, and it’s doable. How satisfying would it be to beat every team in the south and then in the title game avenge many past abuses from Chris Peterson. Tonight is the first time in a long time I’ve actually felt like we’re good. This feels like the last half of 2007. Yeah with the appearance of a real offense the last three games, there is a chance that we are legitimtally good. I think this schedule (Oregon at home, and road games against an improved UCLA, a decent ASU, and a pretty good Colorado team vs. USC with 4 bye weeks) is to much to overcome. Plus, we have been really blessed on the injury front. My Utes fan PTSD is in remission. I loved the confidence and aggressiveness the team played with on both offense and defense. It was beautiful to watch them take the game to USC. Huntley seems so comfortable now, and suddenly seems to have a bunch of weapons in his receiving corps — guys we haven’t seen much of this season. His long passes were excellent and that lightning strike he threw to Simpkins for the TD was a thing of beauty. We could all go on and on. I’ll just say that tomorrow’s my birthday and tonight I got two early presents — first, a Ute beatdown of USC and second, my favorite National League team getting into the World Series against my favorite American League team. A pretty good night. Sometimes it takes a while, LA. That was SoCal’s and my point about Brian Johnson the other day. These kids are still growing up. Last edited by SeattleUte; 10-20-2018 at 10:43 PM. I hope you enjoyed the birthday present I gave you. You spelled Mike Leach wrong. Well, that’s always what a special season requires. God bless us on the injury front! He can’t beat CP. The Huskies win by about 50 every time they play. Happy Birthday LA. Are you in town next week? Let's get to Hire's and I'll buy for an old man. We'll celebrate you and this offense that has developed now for three weeks in a row. I'll give you a ring. Any chance we make it into any of the polls tomorrow? I hated to do it, but I had to chew I to my Duck coworker for failing to free up one of those high twenties spots. Actually, it’s because it’s my birthday that both the Utes and the Dodgers won tonight. You are all welcome. Last edited by LA Ute; 10-20-2018 at 10:54 PM. Fans get too high when things are going well, and too low when they aren’t. 12 games is a long season. A lot will happen over the next 4 games. This game did not “likely determine the PAC-12 South title”. This game did not “likely determine the PAC-12 South title”. Agree. I hope we win out, but that's asking a lot. I watched about half of the UW/CU game today. The Buffs looked pretty good on the road. Oregon has looked very good every time I've seen them this season. I don't know what I'm looking at here. 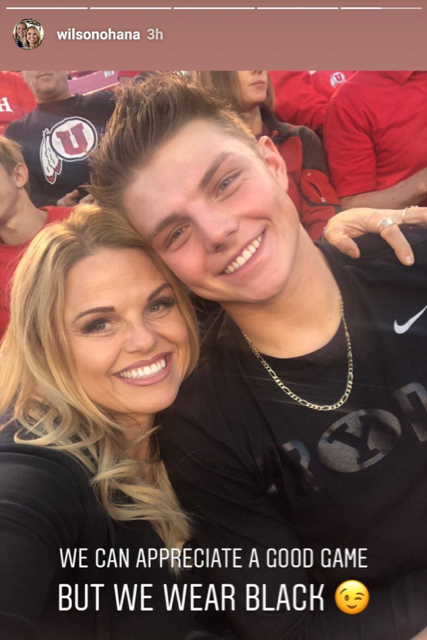 BYU’s starting QB Zach Wilson at the Utah game. I don’t get the “but we wear black” punchline. There was some guy in the south end zone dressed head to toe in BYU gear. Don’t understand people. Zach Wilson scouting the Utes tonight at Rice Eccles. Notice the subtle BYU gear. I’m just glad that he’s already found him the traditional BYU QB Utah game turnover chain. The funny thing is, when Tufele returned the fumble for the TD, I thought history was repeating itself. I immediately thought of Kaelin Klay dropping the TD a foot short of the goal line that enabled Oregon to go up `14-0, in almost exactly the same place that Tufele scored. I thought "OMG, here we go again." I thought it might be over by halftime. Nope. This was a Polynesian dude who was literally head to toe in the ugly blue...with a Y on everything. His hat. His coat. His t-shirt. Saw a guy in a UCLA Jersey. That was a head scratcher.